Cloud Accounting? Maybe you’ve heard that “you can use the best QuickBooks hosting service” and didn’t know what it meant or if it even applied to your business. Or, maybe you have multiple locations and need everyone working in a centralized best QuickBooks hosting service data environment and doing it as simply as possible? Imagine, if you will, commencing work at your desktop or notebook computer and signing into QuickBooks. It doesn’t matter where you are located, nor does it matter where your staff is located. As long as you can get to the internet, you can get to your QuickBooks. Visualize this, and you’ve got the idea of “hosted QuickBooks service”. Now, visualize your current configuration to get to QuickBooks. You’ve probably heard things like “office servers, remote desktop connection, terminal services, WAN, VPN connections” and all sorts of other technobabble when it comes to connecting your team to your QuickBooks file(s). With a “best hosted QuickBooks solution”, you don’t need any of that. That’s right. You are outsourcing all the geeky IT stuff that is needed to make all of this work to a company known as a “QuickBooks hosting service“. Their team of trained experts does all the heavy lifting on their end so you don’t have to. Cloud9 Real Time is one of a handful of companies currently approved by Intuit that provides this type of service for accounting, bookkeeping, and other businesses that are looking for a simple, reliable way to connect their team to QuickBooks. 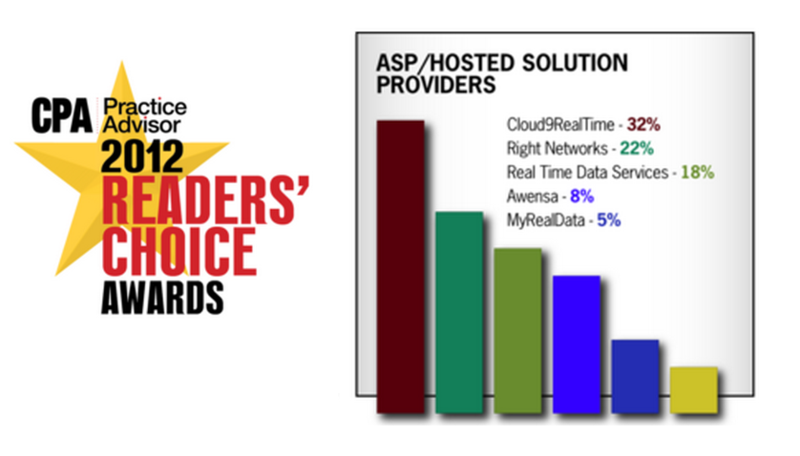 Recently Cloud9 Real Time was voted far and away the #1 QuickBooks hosting service by 4000 accountants who participated in the 2012 CPA Practice Advisor Readers’ Poll. Cloud9 offers a service called “eDashboard” that is a best QuickBooks hosting solution (and hosts Sage, Lacerte, Peachtree and many other application hosting plans). It can work with QuickBooks Pro, Premier or Enterprise software, so you have flexibility to meet the needs of your business. In addition, they offer the ability (should you need it), to host other software that works with QuickBooks such as Fishbowl Inventory, SmartVault, QVinci, and Bill.com. ISN’T IT EXPENSIVE TO USE THE BEST QUICKBOOKS HOSTING SERVICE? Let’s ask the question another way – how much cost (both hard and soft costs!) is there to keep your current QuickBooks configuration up and running? You probably don’t see it directly, but those costs are embedded in your profit and loss report right now.